The Affordable Care Act has created a myriad of challenges for healthcare leaders. Financial concerns are weighing on the minds of hospital CEOs. Tasked with setting strategy and managing its execution, leaders are a driving force behind employees' efforts to be engaged in and remain focused on quality patient care, even as complex new business models impact their workplace experiences. According to a recent Willis Towers Watson study examining the impact of employee perceptions on hospital outcomes, the employee opinions of the tone set by leaders are prominent among the drivers of patient satisfaction and quality of care. 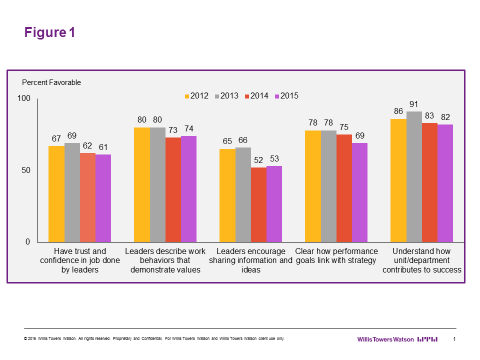 Willis Towers Watson research has also uncovered trends specific to leadership effectiveness from 2012 to 2015.2 The opinions among hospital employees who react favorably to questions about leadership and the workplace have declined in many areas, with some predominant themes. Opinions of leadership ability to communicate down the line to all levels and perceived openness and honesty of communication both started to decline in favorability from 2012 to 2013 and leveled off with no improvement by the close of 2015. Declines in scores related to communication suggest that as pressures on the business model linked to healthcare reform started to build, employees began to listen for more information on plans and performance. In the process, they became more critical of leaders' effectiveness reaching workers and the veracity of the messages heard from the top ranks. Surely missed was an opportunity to engage employees in understanding and driving the changes needed to adjust to the new dynamics in the healthcare industry. The next domino to fall was employee trust in leaders. As confidence in communication erodes, loss of trust is sure to follow. Evidence of this decline in employee sentiment is shown in Figure 1. Opinions of trust and confidence in leaders, stable from 2012 to 2013, began to decline from 2013 onward, a trend continuing through 2015. The same general pattern is true of employees' viewpoints that leaders effectively describe the work behaviors that demonstrate organizational values, and opinions that management encourages sharing information and ideas. These patterns reinforce the conclusion that a breakdown in communication (both from leaders and across the organization more generally) spread to a lack of trust and an undermining of the foundational values that guide behavior in a patient care setting. Also shown in Figure 1 is a drop in positive sentiment in another topic related to communication. With trust in communication and leader messaging in question, the link between personal effort and organizational outcomes begins to erode. A lack of understanding of organizational priorities and performance clouds the role of each person in driving collective results. Figure 1 thus shows declines in employee understanding of how individual performance goals link with strategy and even how individual departments drive business success. Other results suggest that the consequences of the breakdown in communication and the associated loss of trust, confidence and personal alignment are severe. Trends in favorable opinion from 2013 to 2015 paint a picture of a workforce increasingly critical of leadership capability to drive change, disconnected from organizational goals, and working with less pride and inspiration to deliver best efforts. Specifically, as Figure 2 shows, employees report less confidence in leaders' ability to manage change and less clarity regarding how well the organization is doing against its goals. Moreover, employees indicate less engagement at work as evidenced by declines in favorable scores for pride in the organization, advocacy of the employer, inspiration to deliver best work and belief in goals. Healthcare industry leaders must deliver more effective communication. In time of crisis and major change, employees need more information from leaders than when times are good. Information about concrete steps planned to address business challenges and drive organizational improvement will reassure employees that leaders understand the business circumstances and are responding accordingly. Such communication will rebuild trust and confidence in leadership capability to plot the right course. Leadership communications should continue to reinforce the role of employees in driving success and the work behaviors that will deliver the level of patient care required. It is critical to stress that the fundamentals of business purpose and how the organization is structured to fulfill that purpose are largely unchanged — and in fact, a focus on performance goals is even more important in times of transition. Encourage employees to share what they are hearing across the organization and likewise give them forums to express their ideas. Employees are the ultimate organizational insiders and often can provide unique solutions to the challenges they encounter on a daily basis. Act on the perspective that strong leadership will drive both confidence in change management and individual engagement at work. Leadership effectiveness is the top predictor of employee engagement — both across all industries and in the healthcare sector. Steps to improve leadership communication and ensure personal alignment with organizational goals, especially in times of crisis, will thus instill levels of employee attachment and effort that contribute positively to business performance. Just as more critical views of leaders can erode motivation and effort, concrete steps to improve leadership effectiveness will increase engagement and have a positive impact on the business. The new landscape created by enactment of healthcare reform — and its subsequent impacts on priorities for hospital leadership — have emerged over time as court challenges and even a government shutdown have marked the new law's early history. The impact of the reform on hospital employees has likewise been evolving. As this review suggests, the news so far is discouraging as employees now report less confidence in leaders, less alignment with emerging business models and lower engagement. Opportunities are thus present for leaders to reconnect with the employee population and enroll them in efforts to master the new world of healthcare and shape what success looks like in the post-reform care delivery environment. Patrick Kulesa, Ph.D., is a member of the advanced analytics group within Willis Towers Watson's Research & Innovation Center. He oversees teams that manage Willis Towers Watson's database of benchmarks on employee opinion and studies the links between employee opinion and a wide range of business performance data. He has a Ph.D. in social psychology from Northwestern University and 17 years of consulting experience.